Then ... I'm afraid I need to raise a wee question mark around the shuttle in your earlier post, Starrigger. The dimensions you have for it make it wider than it is long (length/width ratio approx. 1:0.8 ), consistent with the proportions you have drawn. 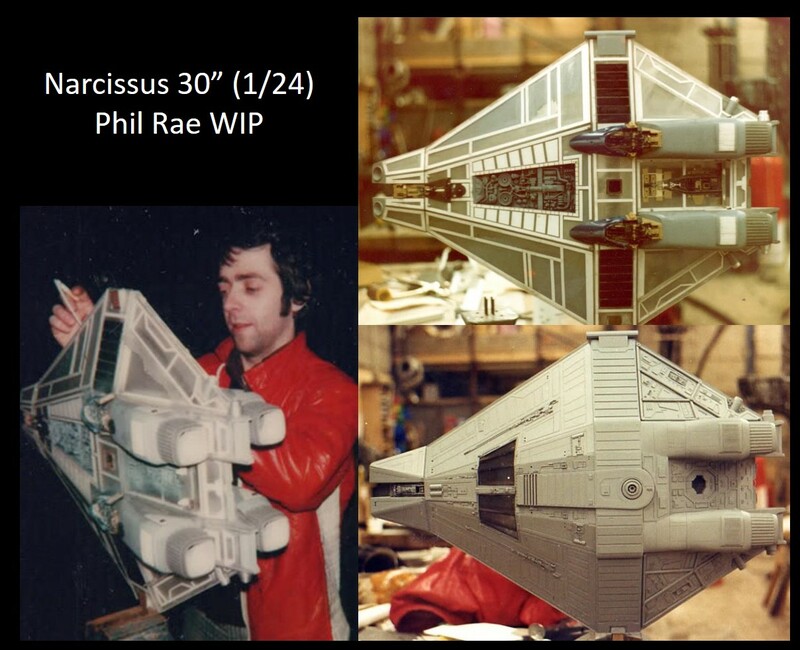 However; I'm certain that I've read somewhere how Phil Rae describes this as a "forced perspective" model, meaning it was only meant to be shot from dead ahead, where the foreshortened proportions are obscured by the perspective, and that it thus wouldn't represent the intended look of the vessel. It seems to me the shuttle has distinctly different proportions, with the length/width ratio being approx. 1:1.4 (which, assuming a length of 16.6m, would make the shuttle 12m wide). Would you agree with my observations, or do you feel I'm barking up the wrong tree, here? I whole heartily agree with your assessment that the proportions I quoted were probably based on the foreshortened model not the "Actual" dimensioned one. thus one of the reasons for the request for fact check, thanks sooo much for the research. That being said, we still have the correct width and height as these dimensions would not have changed for the forced perspective one. The length however would have (the dimension being forced): They would never have been able to see inside the windows if they did not push the nose in to get a better angle on them. Then it occurred to me that there is enough room for at least a partial sub-floor, the entire flight deck is in the top half of the Narcissus! The hatch represents a slanted, floor-to-ceiling opening, why couldn't there be additional sleep chambers below deck? Still doesn't explain the lack of additional seating, (Ripley braced herself for a jerk as the Narcissus dropped free of the Nostromo, so the process of separating was known to be bumpy) but maybe some fold out like flight attendant seats? Or "Stow-and-Go" seating? Thoughts? Yeah; I hadn't a clear idea of which dimension was the governing one; the length or the beam. But if we fix the latter, that would mean the entire shuttle is about 27.5m long. 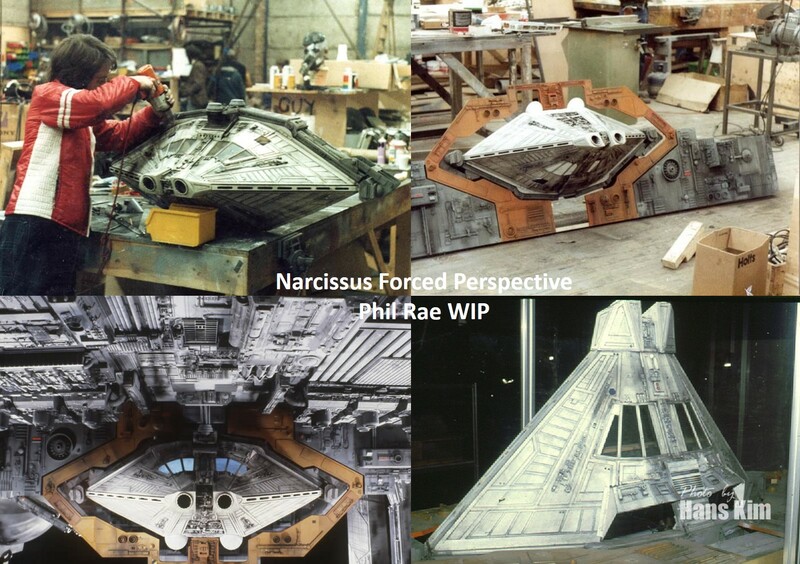 However, if we use Phil Rae's own figures (that the model is built in 1/24th scale and is approx. 30" long), that would mean that the Narcissus should be more like 18m long (ergo 13m wide, by the proportions). In your width measurement, what is the governing factor? What is it based on? Regarding the additional space idea you had, I agree that the crew deck of the Narcissus clearly only occupies the top half of the hull. 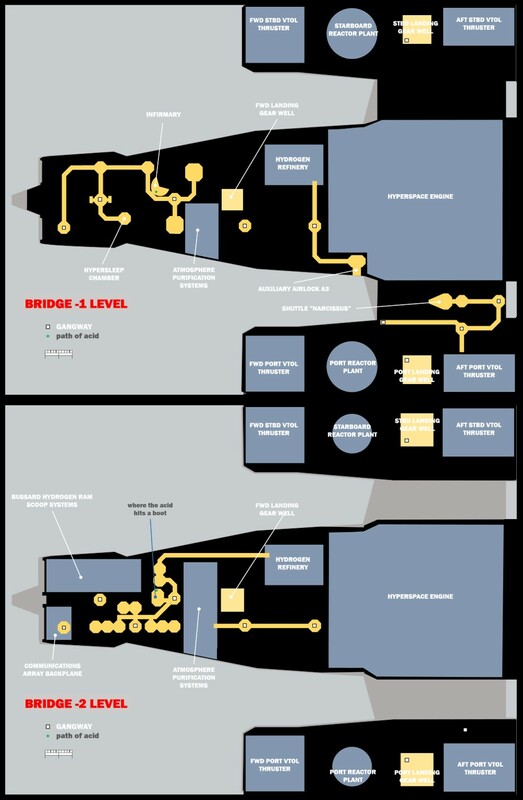 Otoh, the ship still needs to have a power plant, fuel storage, oxygen supply, air scrubber, potable water supply, and so on, and so forth; I have always assumed that these go into that lower deck. But still, there might be just enough space for one additional cryo pod -- in fact, now that you brought it up, there really must be. The only absolutely limiting factor we have is that Ripley unequivocally states that the shuttle only has space for three (okay, what she really says is that it "won't take four", but all practical intents and purposes etcetera). 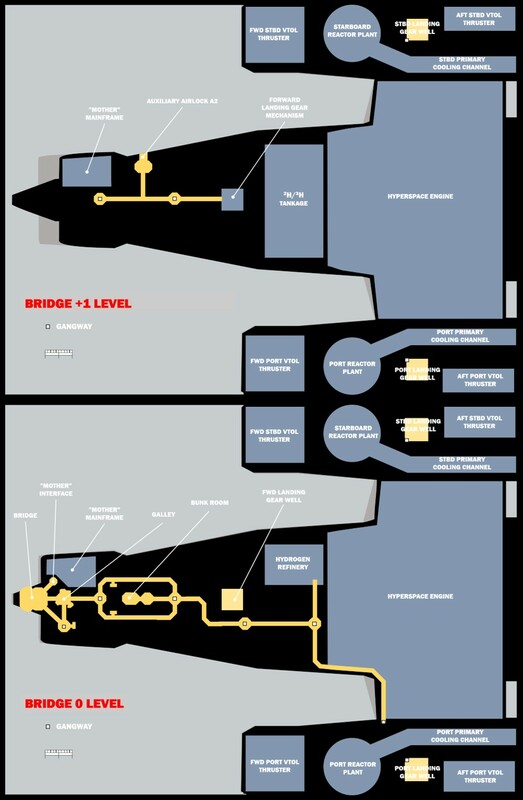 But since we've been lacking a third cryo pod inside the cabin, I think we can now safely assume that it's belowdecks! In consequence, the other "closet" (the one Ripley doesn't take refuge in) must have a ladder to that deck. Seating however we already have: the "pilots'" seats, one fore of each cryo pod, and the centrally placed seat aft of them; three in total. Good call, Starrigger -- you've solved a major discrepancy with the Narcissus! While at it, I thought I might as well explain a bit about my thinking regarding the "Bussard Ram Scoop" thing ... judging from the comments I've got on that, I realise I have been criminally negligent with regard to my clarity. I assume that everybody here knows what a ramjet engine is -- basically an open tube with an aviation grade kerosene burner inside; tube moves forward through the air, air is "rammed" in at the front end, fuel is injected and ignited, air heats up, expands, rushes out at the back at an increased velocity, Newton's third law and all that jazz, result is propulsion, right? Now, the Bussard ramjet is a concept proposed by a physicist named Robert Bussard back in the 50's-60's. It takes this same concept, but translates it into an interstellar medium: the tube now consists of an increasingly constricting magnetic funnel, and the air is replaced with interstellar hydrogen. Hydrogen is rammed in at one end, gets constricted to an ever higher pressure until a fusion reaction ignites, and the resulting energy expelled at the other end propels the spacecraft forward. This idea has been loved by surely a dozen Sci-Fi authors back in the 70's and 80's; myself, I particularly remember it from Larry Niven's Ringworld books, and the related Man-Kzin Wars series. This is not a technology I propose the Nostromo uses. For several reasons. The geometry of the ship is all wrong for it to use such a device as its main propulsion. I have already nailed down that in my designs, I will postulate a reactionless drive technology, and the ramjet is a Newtonian propulsion system. I am not altogether sold on the concept's viability. To name just a few. However, I am postulating that the Nostromo has fusion reactors as its main powerplants. Fusion reactors depend on hydrogen (or to be specific; deuterium amd tritium). Now unfortunately, I can't in good conscience reconcile the ... stuff ... going on at the opening end of the tube-thing's funnel-aperture-thing end with any other function than a fluid inlet of some sort ... so, I thought, why not say it is one? The idea to collect interstellar hydrogen -- not to use as a propellant to drive the ship forward, but to refine into said elements and top up the ship's reactor fuel tank -- appeals to me. So I'm thinking, why not use the first part of the Bussard concept (the scoop, not the jet), and imagine that the ship is able to generate a vast force field, perhaps a mile across, as a funnel ahead of the ship to collect the stuff. And indeed, why not? Clearly Nostromo's builders have mastered force field technologies beyond the scope of our current understanding (what with artificial gravity and whatnot). Such a device ought too be within their scope, inwould imagine. So, this force field scoops interstellar hydrogen as the ship moves forward during its hyper transition acceleration, and directs it into the tube. There it is collected as raw hydrogen, and moved to the refinery that converts it into fusion fuel, and is fed into the fuel tanks. The idea would not be for this to be the ship's only or even main fuel source, but rather a way to use a plentiful natural resource to improve the ship's fuel efficiency. Plus -- most vitally -- it provides a rationale for the tube-thing that, to my eyes, is consistent with the way the thing looks. So for the time being -- until I think of something cleverer -- this is the idea I'm going with. I do not claim it is the only possible solution, or that it isn't perhaps just a tad contrived, but needs must ... the tube-thing must be there for something, and I need that something to make sense with the way its opening looks to me. 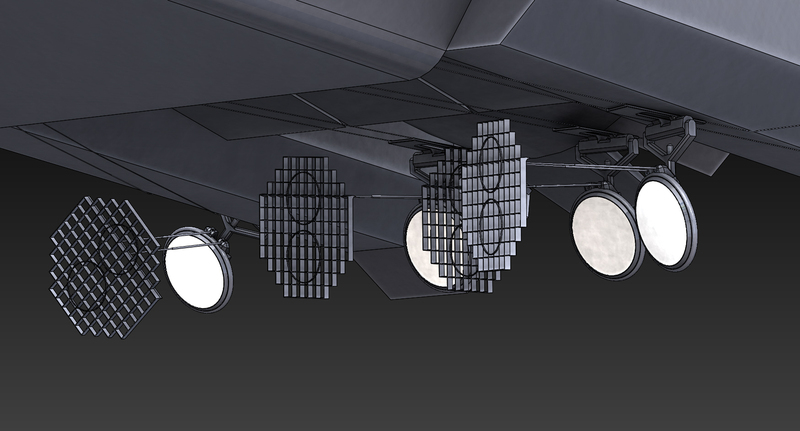 I thought I'd elaborate a bit on the idea I had about the floodlights travelling along tracks on the hull, by showing what such a light fixture could look like. 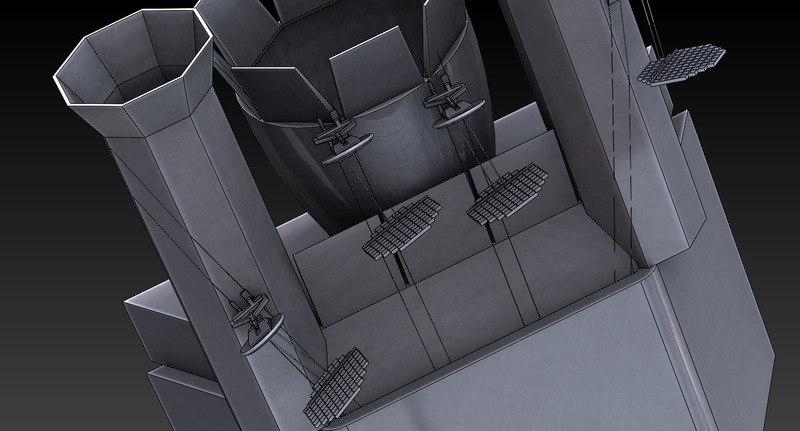 Over the cylindrical section of the main engine, I imagine the tracks could just go the straightest route and hang on a limited number of struts, in mid-air, as it were. Or mid-vacuum, rather. 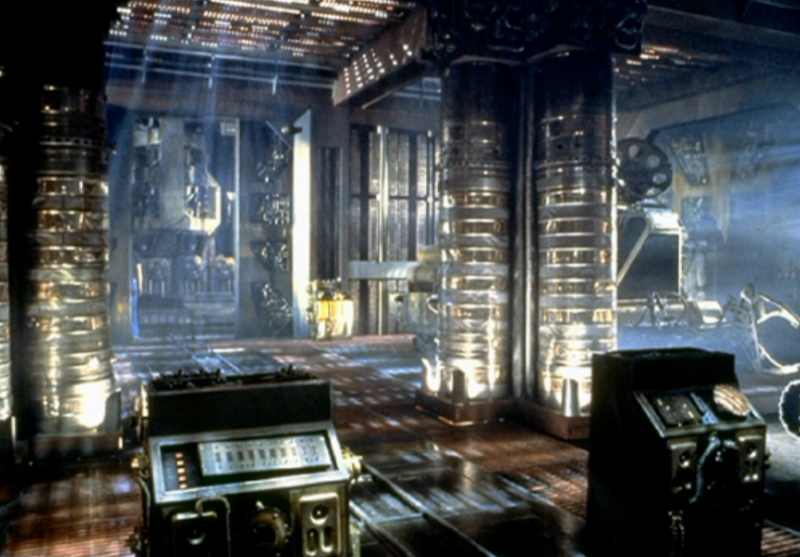 Also: here is an unusual shot of the engine room that I've never seen before. 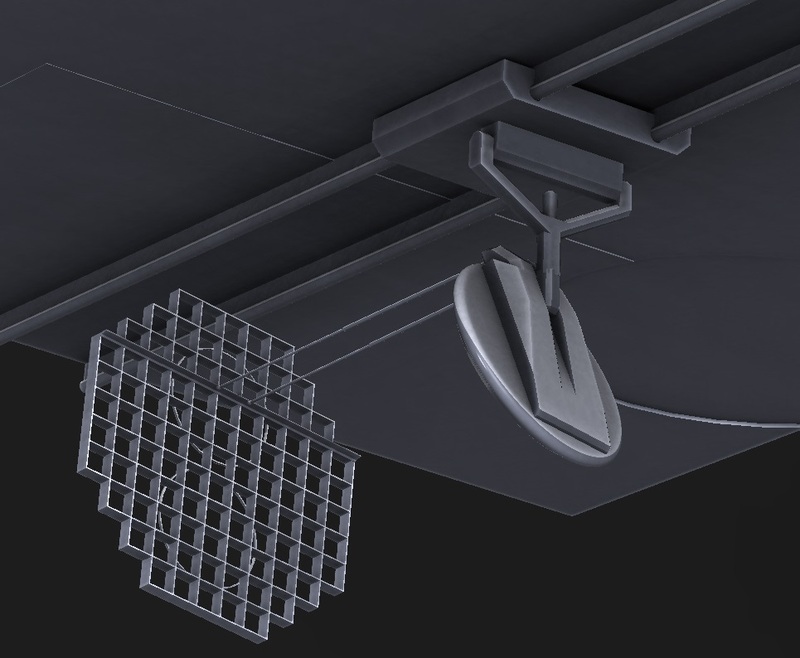 And a shot from under the portside "arm", looking forward and showing a nice gap in the hull for something like: a) an airlock, b) a cargo bay door, c) who knows? And, of course, the airlock/blister nubbin. With this and that shots of the stern, which might be helpful with scouting tracks, etc., for those floods. Been a while since I checked in here. 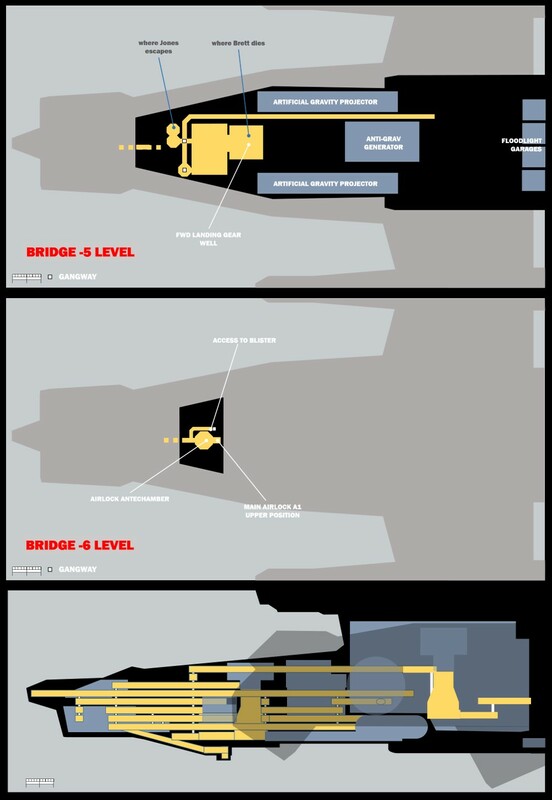 I'm really liking Vader's layout, and I think it's interesting how some of the lower decks are starting to resemble FenGiddel (Darrel) 's older one from The Nostromo Files. I think most problems have been sorted out, like ignoring the inconsistencies with ladders (some of them even seem to change when you think you're looking at the same one in the movie), so I think this is approaching a believable point of usability, if not completion. There are a couple of things that I still see missing, though. The first is that, while chopping up the bridge deck works fine, there is definitely something behind the door aft of the port-side ladderway. Next, I think I recall this thing being in the movie. I could just have a terrible memory, who knows. But if it is, have we decided how it would exit the Nostromo? It's clearly supposed to. 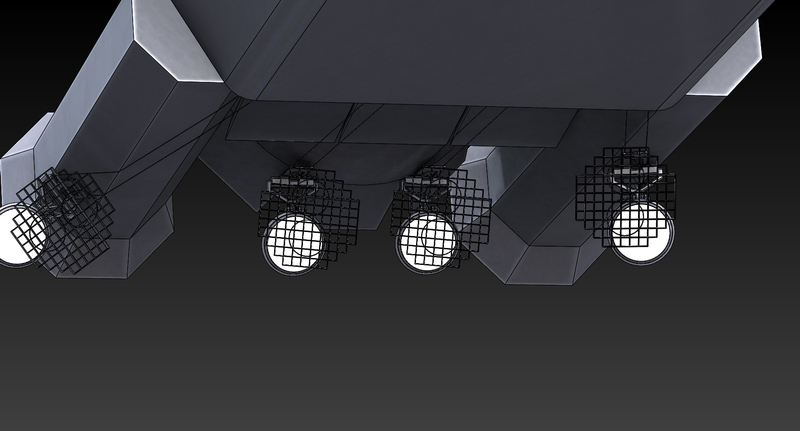 I've been going off the assumption that the entire Garage/Landing gear area can be sealed off and function as its own airlock, allowing such a craft to fly through the doors to the landing gear area, and exit through the same hatch that the gear deploys from, if there's enough space. What role would a tracked vehicle play on-board a spacecraft? Particularly one that looks like it wouldn't fit in the standard corridors. It also shows my last point of interest, more large doors on the sides of the garage. 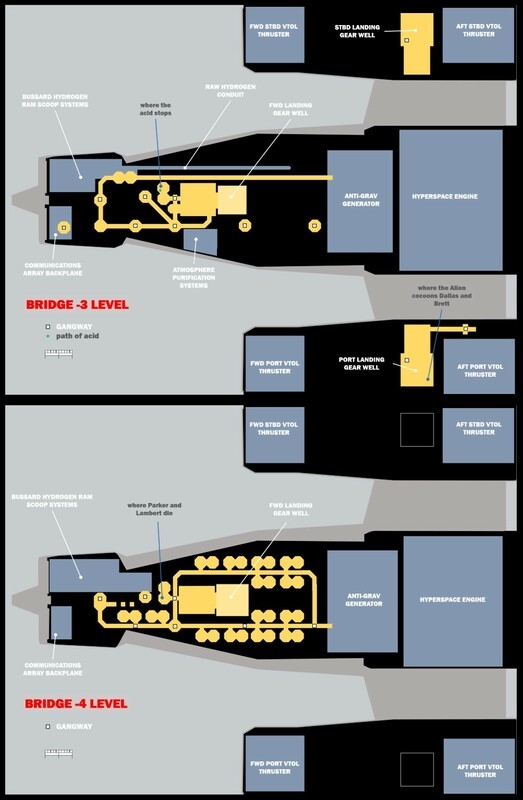 I think there could, in fact, be two or three garage sections on the bridge -5 level. It's been mentioned before, but I can't find a conclusion. 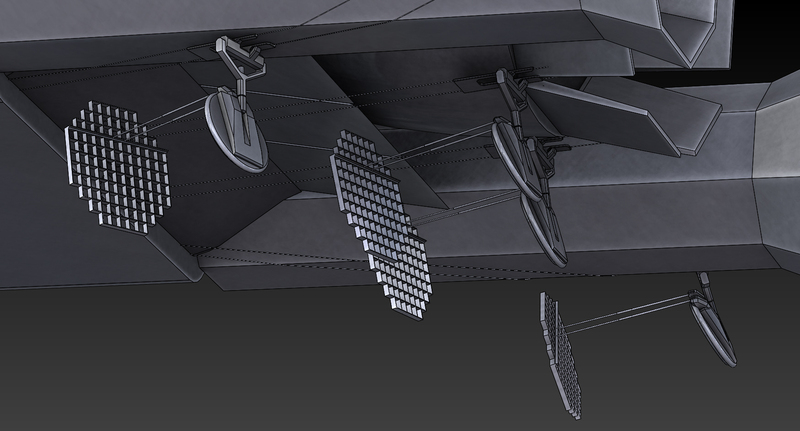 Unfortunately, because of the way the hull angles inward as it goes down, there isn't really space for those garages. SO, instead, maybe a section of the hull behind those doors opens up (like, folds up or down), letting the garage serve as a large airlock, and also allowing a method for the small exocraft to enter and exit. MAYBE, that section folds down far enough to serve as a ramp and allow the tracked vehicle ground access. The current layout seems to allow for it. I think I got everything out clearly, hopefully I didn't misread or confuse myself looking at so many different photos and possible schematics. Welcome back, jkruse05! Good input and the pictures are awesome. 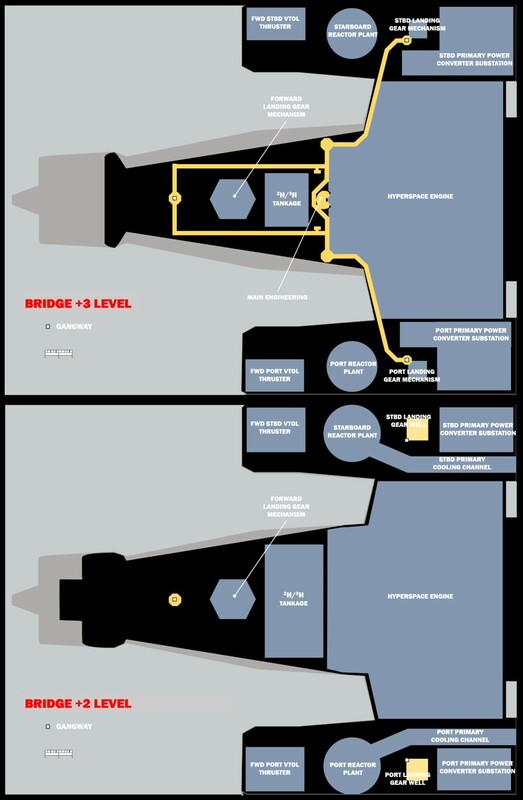 I've been looking at the ship again and wondering if separate access hatches might be an alternative. There are "greeblie" panels on the 7-foot miniature that could be used as exterior hatches for the garage bays. Also: I will have to go back and look again at that junction you mentioned to think about what might be behind that door. jkruse05 — thanks for the input! Not sure which door that is though — could you point it out for me? 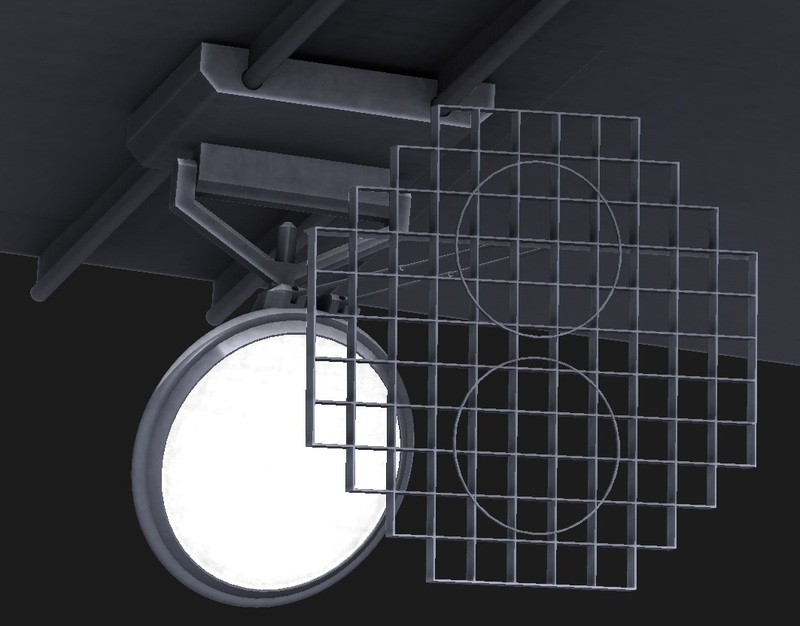 In the meanwhile -- I did a bit of further work on my floodlight concept a few months ago; didn't get around to posting pics at the time. I placed rails where it would seem likely for them to be in order to transport the floodlights from the hull garages I've postulated, to the positions seen on-screen. 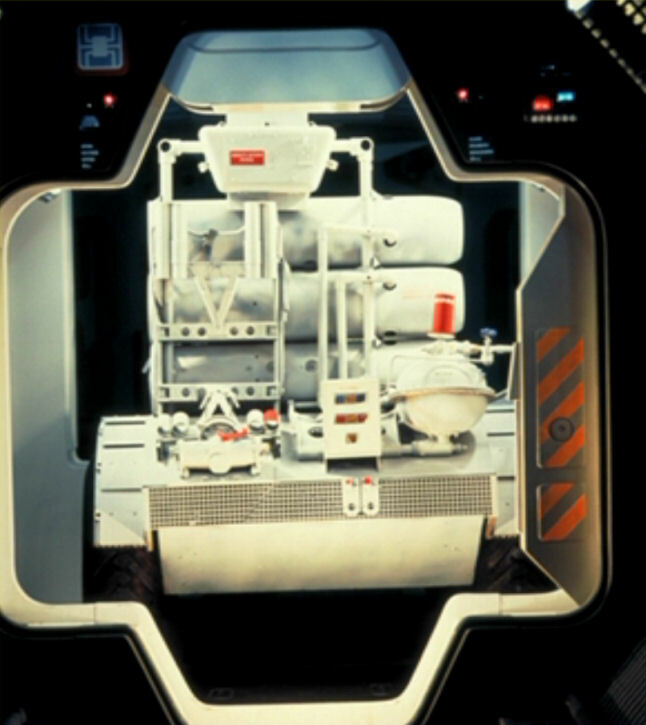 The idea here being that the rails (probably made from some graphene monofilament mesh tube or other similar super strong material) are too thin to be visible at the scales we get to view the Nostromo. Note that the port outer floodlight is still on the way to its outboard position; the pictures capture it midway along the port auxiliary thruster. Just what SolidWorks produces off the bat ... I tried to replicate the geometries closest to the hypothetical tracks as close as I could. Seems like it could work, though. Huge thanks for posting that picture -- I'd completely missed those doors! I may have an idea for how to incorporate them though ... they solve another conundrum I've had. As for the tracked vehicle ... it is a bit of a bother. And what's with the bomb rack on the rear section anyway...? 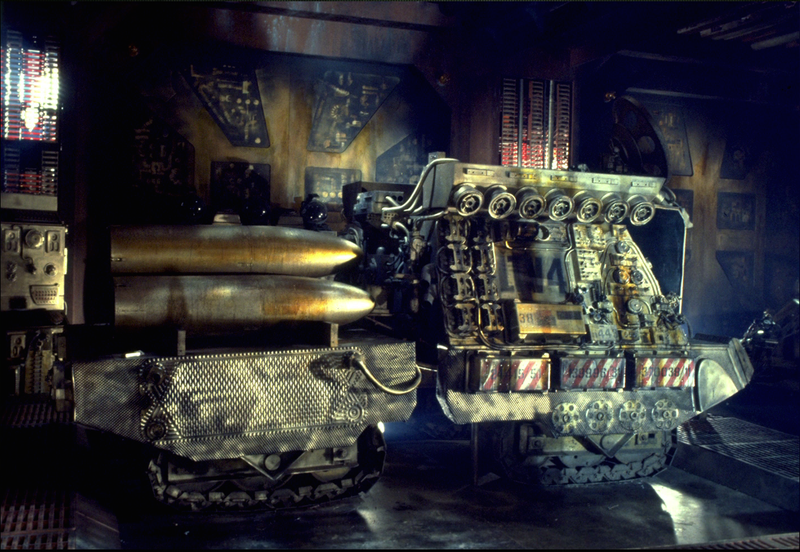 The vehicle is on the deck that has the "floor" of the landing gear compartment when the gear is retracted -- it's the vehicle that Jones hides in after being zapped with the cattle prod. I've been hypothesizing that it is used to transport stuff basically within the confines of that specific area -- the garage, adjoining spaces, and the gear well. But that's just my working theory. there is definitely something behind the door aft of the port-side ladderway. It seems I may have missed some shot or pan somewhere -- I'd be curious to know which door this might be? It looks like you may have set it up as a storage room or something, but the door is nearly as wide as the hall, so it's more likely that it leads to a room or another hallway. It's the one circled in red. It could be as simple as a hallway that leads inward and aft to connect to the stuff you already have. You can just barely see it in this shot, as the camera moves down the portside hallway from the bridge, but it's clearly a door frame, not one of the hallway rib structures. Also, as I look at this, has anyone put any effort into deciphering the panels placed over the doors and hallway entrances? I'm sure they're supposed to be directions to various rooms. Also, here's a shot posted earlier that shows the front of the tracked vehicle and one of the large doors. Notice the sensor dish on top and the large robotic claw sticking out the front. To me that claw is reminiscent of the power loader in Aliens. I think the tracked thing is too big to pull any cargo down hallways, but maybe between garages if there are multiple sections. This thing looks like it might fit through the larger hallway-size doors, but it can't quite make it into the small ones. Perfect — exactly the information I was looking for! Thanks a huge lot, jkruse!! Powerloader was actually pretty much what I was thinking, function-wise. A device for shifting stuff within a certain defined space. I do however wonder if that round feature is a sensor or dish antenna ... those large perforations would sort of defeat the purpose of an antenna dish. Instead, I was wondering if it might be some kind of a dedicated manipulator/gripping device, for some particular class of items with a specialised connector. Also, as I look at this, has anyone put any effort into deciphering the panels placed over the doors and hallway entrances? I'm sure they're supposed to be directions to various rooms. Those symbols are from Ron Cobb's "Semiotic Standard", and indeed, they convey information about what areas or systems can be accessed that way, what conditions prevail in areas behind (pressure, gravity), particular hazards, access points, emergency equipment, etc, etc. Some images with explanations of the semiotic standard have been published, but I can't seem to find those particular symbols anywhere in the ones a quick web search turns up. BTW - those little T-shaped closet things I have here and there in my deck plans are heads. Sorry Darrell -- I had missed this post (or at least ... the links in it)! THREE pillars...? This must be somewhere in the middle of WIP, before things are in their final places ... perhaps they're playing around looking for where the features look best? Those blocks of wood would certainly suggest something like that.